Mamma Mia! started as an experiment: could you write a musical backwards, using existing songs, weaving a story around them? Producer Judy Craymer came up with the idea and she approached me and Benny Andersson. When she introduced book writer Catherine Johnson to us, we were on our way. The stage musical and the movies became successes beyond my wildest dreams. They seem to make people happy, they kind of get you in a party mood - and everyone loves a party. The idea for another experiment gradually grew: maybe you could have a party in a sort of Mamma Mia! environment? Yes, but what exactly would that environment be? Well, the obvious place for such a party would be in a taverna on the island of Skopelos, where most exteriors of the first movie were shot. This imagined and wonderfully exotic Greek taverna - and its equally exotic landlord Nikos, his family and friends - was first magically transferred to the Tyrol Restaurant in Stockholm; it's now in its third sold-out year and will be opening it's doors at London's The O2 in the Summer of 2019. When our guests enter Nikos' Taverna, they will feel as if they're right in the heart of a Greek island paradise, eating great Mediterranean food, drinking, singing and dancing to ABBA songs in a Mamma Mia! world. So do join us for an ouzo or two, I'd love to see you here! Group bookings are available for 16 - 500 guests. To get you excited, check out the trailer video below for Mamma Mia! - The Party. Mamma Mia! The Party will take up residency in a specially adapted venue within The O2 Arena Complex at Greenwich Peninsula, South East London. 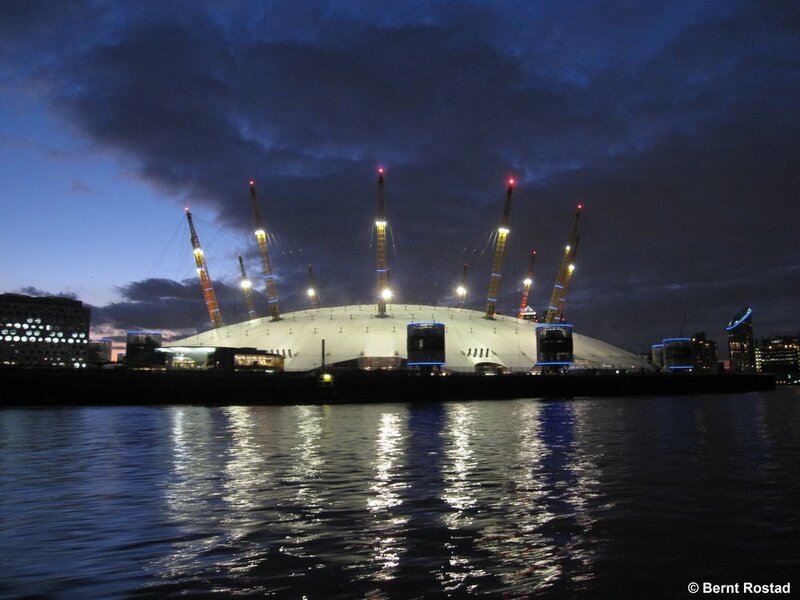 The O2 is the world’s most popular music and entertainment venue, including a state-of-the-art arena and is easily reached by tube to North Greenwich or by Thames Clipper from Central London. The Premium tables are on the ground floor in the Courtyard and the Terrace level; Band A and B are on the Balcony in addition to the Courtyard and Terrace levels with Band A naturally offering the better seats. However, Mamma Mia! The Party is a fully immersive theatrical and dining experience and the action takes place all around the venue, so you will get a great view wherever you sit. Please contact us to discuss enquiries for small and large groups alike. 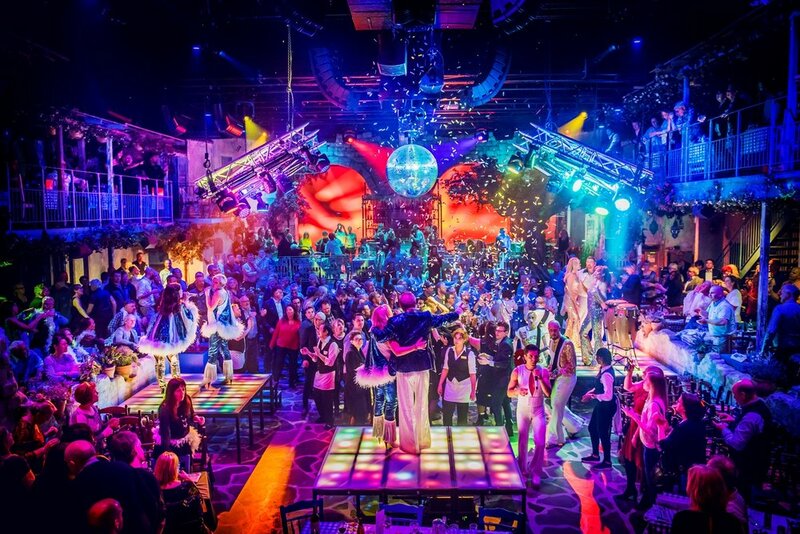 Entertainment lasting around four hours that includes an immersive theatrical performance, a shot of ouzo on arrival, a three-course sit-down meal, and the opportunity to dance to ABBA music after the show. You can arrive up to one hour before the start of the show to mingle with your guests and enjoy the appetisers. There are evening performances throughout the week & matinee performances on Saturdays and Sundays, details below. For groups of 16 and over: Thursday 29th August 2019 to Monday 17th February 2020, excluding Wednesday 18th December 2019 to Monday 6th January, inclusive. You can view a copy of the sample menu here and drinks will be available to purchase on the day of performance. The Premium tables are on the ground floor in the Courtyard and the Terrace level; Band A and Band B are in the Balcony in addition to the Courtyard and Terrace levels with Band A naturally offering the better seats. However, Mamma Mia! The Party is a fully immersive theatrical and dining experience and the action takes place all around the venue, so you will get a great view wherever you sit. Tables are reserved in the order of receipt of booking. Group bookings will be seated together, with smaller groups or couples allocated seating on tables of up to 8 and larger groups allocated across adjacent tables. The largest tables seat 10 people. 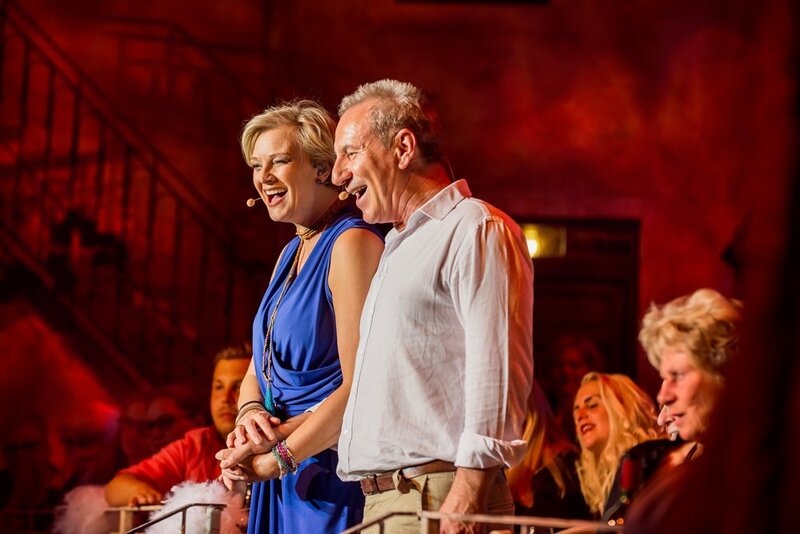 Euro Events London are able to offer a range of Official VIP Hospitality options at Mamma Mia! - The Party in London including private areas, tables and private hire of the venue on selected dates, each suitable for entertaining clients, colleagues, family or friends and of course yourself! The event would also make for an ideal opportunity to say thank you and reward your employees throughout the year and of course at Christmas 2019! This really is an amazing opportunity to enjoy this unique event live in style, so make sure you don't miss out! Contact us for group booking enquiries and possible special prices for 51 - 500 guests. Call us now on 0333 456 7890. All places and prices are subject to confirmation at the time of booking. The show is closed on Mondays throughout December. However, the venue is available for exclusive private lets. Other dates may be also be available on request. Exclusive booking of the whole venue can be made for groups of 400 - 500 people. Drinks packages are available for group bookings. Please contact us for details. This event is not suitable for children under 5 years. Please contact us to to book and to receive further details on attending Mamma Mia! - The Party live in VIP style in London in 2019 & 2020.